Remember Pulp Shakespeare? It’s Back Beginning January 15! Who says there isn’t a Santa Claus? Combined Artform/Theatre Asylum have announced that they are bringing back Pulp Shakespeare (or Bard Fiction), adapted by Ben Tallen, Aaron Greer & Brian Watson-Jones directed by Ovation Award winning director Amanda McRaven. The show will open Thursday January 15, 2015 at Theatre Asylum in Hollywood, and run Fridays and Saturdays at 8pm and Sundays at 3pm through March 8. Reprising their roles from previous productions, Aaron Lyons (Vincenzio de la Vega), Dan White (Julius Winfield) and Christian Levatino (Butch “Butcher” Coolidge) are joined by a new ensemble of talented actors that includes Julia Aks, Drew Derek, Victoria Hogan, Matt Hudacs, Dylan Jones, Marcelo Olivas, Gary Poux, Ian Verdun. The production is stage managed by Emily Gibson and produced by Matthew Quinn and Aaron Lyons. 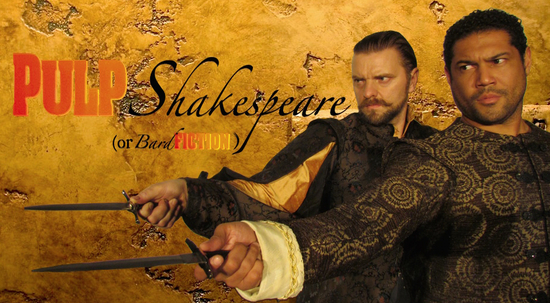 In 2010 it was part of the Hollywood Fringe with additional script changes, directed by Jordan Monsell, who renamed it Pulp Shakespeare. Matthew Quinn came on board after the Fringe and extended the show for a successful 5-month run. Fridays and Saturdays at 8pm and Sundays at 3pm.